SAN FRANCISCO / NEW YORK, June 15th, 2010 – Time Out New York launches its premiere mobile augmented reality editorial for TONY`s “Summer Drinking Special” which hits newsstands June 16. Time Out New York and junaio®, the next generation augmented reality browser, are partnering to provide the first-ever mobile guide to cool drinking destinations in NYC. With just a smartphone and the TONY channel within the junaio® browser, you can unlock summer discounts and deals around town by simply pointing your phone. 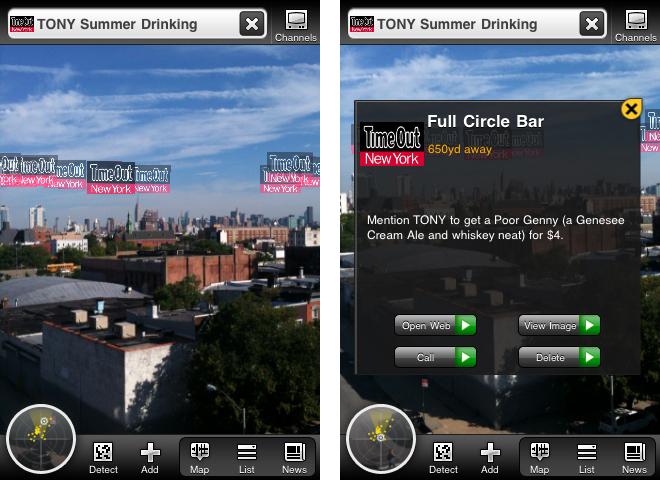 Users can visit the TONY Summer Drinking channel by downloading the junaio 2.0 app for iPhone and Android devices. 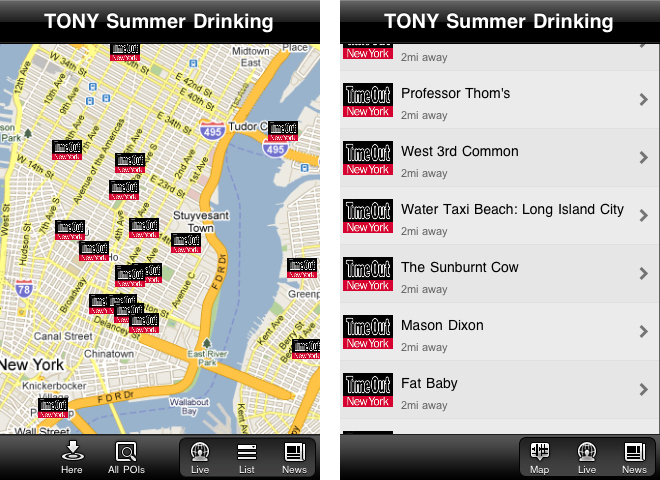 After launching the app and selecting the TONY Summer Drinking channel, users can point their smartphones in all directions to reveal details on featured bars offering deals and incentives, browse venue photos, contact numbers, directions, neighborhood maps, as well as a web link to the actual Time Out New York summer drinking page. TONY`s “Summer Drinking Special” is made possible through junaio®, the exciting new augmented reality browser designed for camera equipped mobile devices. “junaio® delights mobile users with easy and intuitive access to information presented in ways that provide an instant grasp of essentials through unusual and enjoyable new media experiences. Our partnership with TONY shows the potential of extending and enriching offline content for people on the go,” said Lisa Murphy, junaio® Product Marketing Manager.